If you grow a Boston fern indoors, you may find yourself continually monitoring the health and well-being of this challenging plant. A Boston fern requires evenly moist soil and a humid environment in order for the fern to thrive. If you find the fronds and leaves of your Boston fern turning brown, the first course of action is to analyze the growing conditions to ensure you are properly providing a healthy environment for your Boston fern. Assess the moisture of the soil if the Boston fern leaves begin to brown. Never allow the soil to dry between waterings. Provide a thorough watering (enough to completely saturate the soil) when the surface of the soil begins to feel less moist. Check to make sure the Boston fern is not root bound. If the roots are too crowded inside the planting container, the water you provide for the Boston fern will not adequately moisten the roots. Fill the larger planting container 1/4 full with peat moss and 1/4 full of potting soil. Remove the Boston fern from its current container. While you have the fern out of the container, use the pruning shears to remove any outer fronds that are dead or dying to improve the appearance of the fern. Place the fern into the larger container and fill in additional potting soil around the roots to finish re-potting the fern. Fertilize the Boston fern by mixing the liquid fertilizer with water at half of the strength recommended on the fertilizer package. Pour the fertilizer around the base of the Boston fern, fertilizing it once in the spring and another time in the middle of the summer. Do not fertilize the Boston fern any more often than this. Keep the Boston fern at temperatures ranging between 60 and 70 degrees F. Ensure that the Boston fern has a humid environment (a bathroom is ideal) and that you keep it away from sources of dry heat or cool drafts. Place the Boston fern out of direct sunlight and full shade. 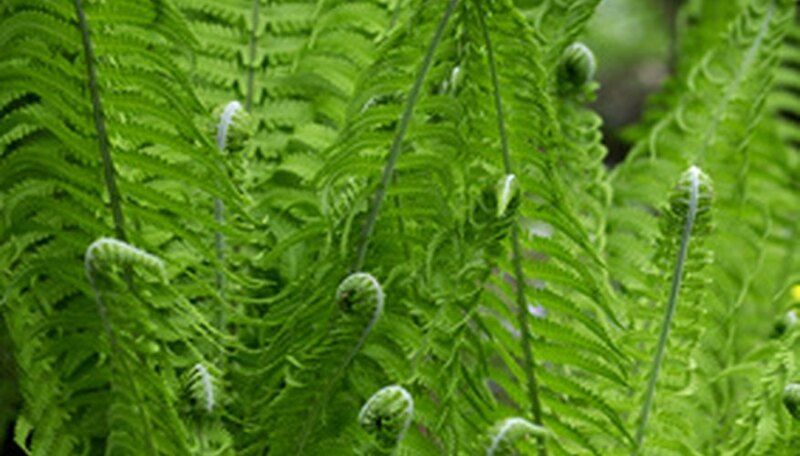 Boston ferns will grow best when they are in indirect sunlight (sunlight filtering through a curtain, for example).